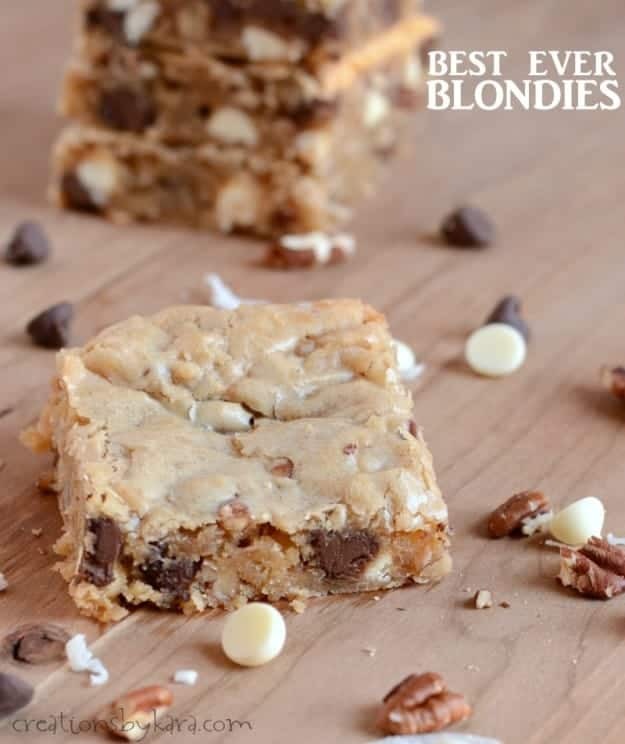 I’ve tasted dozens of blondie recipe over the years, and in my opinion, these really are the Best Ever Blondies! They have that yummy crackly top, but the inside is nice and chewy. And they are packed with so many tasty ingredients that every single bite is heavenly. 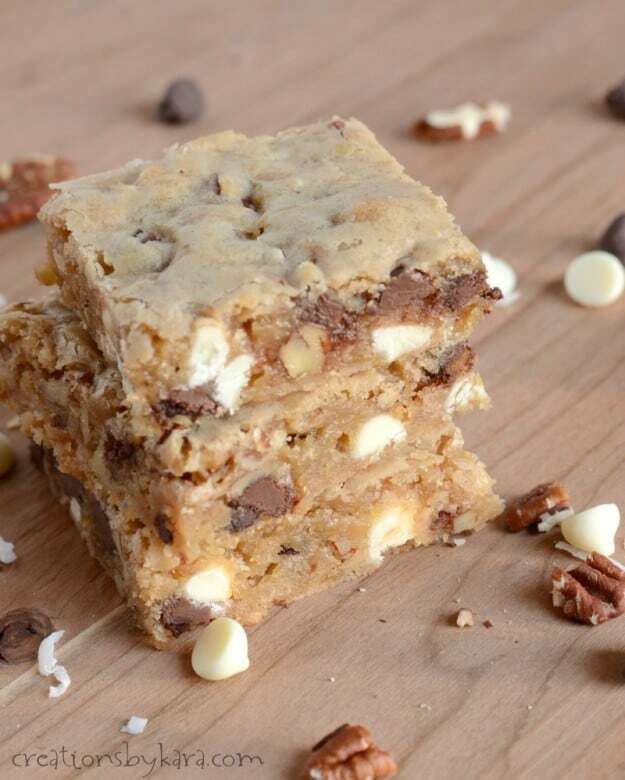 Seriously yummy bars people! My cousin made them for a reunion last year, and I was in love after one bite! It’s taken me way too long to get the recipe from her, but I sure am glad I finally have it! They are chock full of goodness. Two kinds of chocolate, plus nuts and coconut. So darn good! Make sure you let the melted butter cool, or it melts the brown sugar too much and the texture isn’t as good. 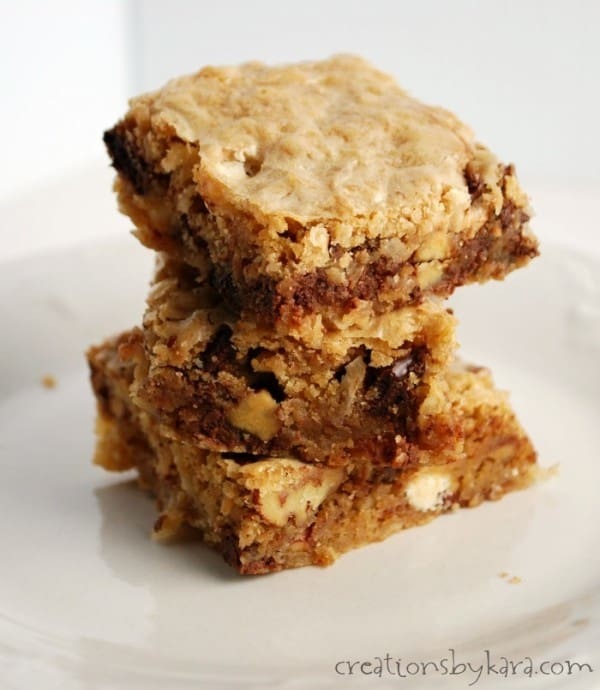 Best ever chocolate chip blondies with coconut, nuts, and two types of chocolate. Whisk together melted butter and brown sugar in a large mixing bowl. Add eggs and vanilla and mix well. Combine flour, baking powder, and salt in a small bowl. Stir into creamed mixture. Add nuts, coconut, and chips. Spread into a well greased and parchment lined 9x13" pan. Bake at 350° for about 22-25 minutes. Top will be shiny and golden brown. Don't over-bake! -To toast nuts, spread on a rimmed cookie sheet and bake at 400° for about 8-10 minutes, stirring occasionally. -To toast coconut, spread on a rimmed cookie sheet and bake at 400° for about 5 minutes, stirring often. Watch carefully, it can burn quickly! Yum! Those sound delicious. This would be a good recipe for me to file away for entertaining! 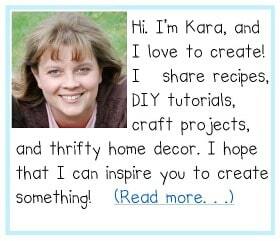 Kara those look delish! Bookmarking this now to make -yum!